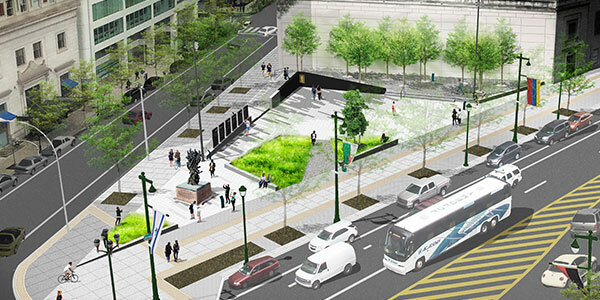 What is being added to Philly’s Holocaust memorial? Holocaust survivor Paula Spigler visited the U.S. Holocaust Memorial Museum in Washington, but can’t return because it was too painful. It looks too much to the past. However, each year she attends the memorial service at Philadelphia’s Holocaust monument at 16th Street and the Parkway. 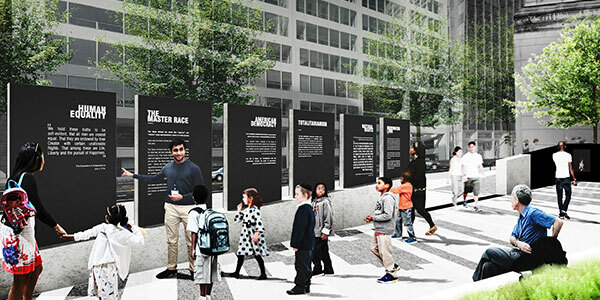 The monument, dedicated to the six million Jews who were murdered, looks to the future. It has been there since 1964, and now the sponsoring Philadelphia Holocaust Remembrance Foundation is ready to announce details of an expansion. The triangular plot of land, leased from the city, will be enhanced with several elements to supplement the statue of human figures consumed by flames, by Polish artist Nathan Rapoport. The most striking addition will be the Six Pillars, representing the six million. The pillars are about eight feet tall and four feet wide, facing Arch Street and the interior of the memorial park. The pillars are paired, with one engraved with American values juxtaposed with one bearing a motif of the Holocaust. The pillars will read “Human Equality” vs. “The Master Race,” “American Democracy” vs. “Totalitarianism,” “Natural Rights” vs. “Nuremberg Laws,” “Freedom of Religion” vs. “Religious Persecution,” “Protecting Life and Liberty” vs. “Death Camps,” and, finally, “Liberation” vs. “Bearing Witness.” Each will have some explanatory text. 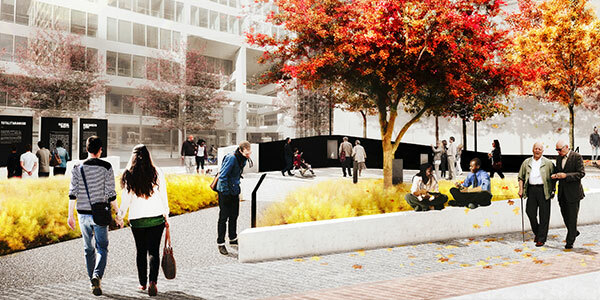 At the western end of the plaza, a black granite remembrance wall will include a recessed eternal flame. Beyond that will be a planted grove, representing the forests from which prisoners who escaped joined partisan groups to fight the Nazis. The grimmest addition will be train tracks embedded in the sidewalk, symbolizing the trains Jews were herded on for transport to labor or death camps. “Standing at the birthplace of American democracy, the train tracks, forest and other elements serve as a reminder of the travesties that can result from a culture that loses its moral direction,” said David Adelman, chairman of the Philadelphia Holocaust Remembrance Foundation. Total cost of the project is about $7 million, almost all coming from business leaders and individuals, bolstered by a $1.5 million state grant.